I bought an old-fashioned pie plate in the January sales but it languished in the pan cupboard until this week. 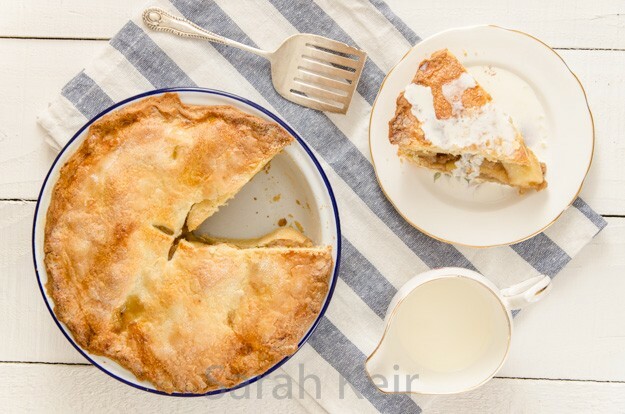 It has a classic retro feel about it so I just had to make a good, old fashioned apple pie. Now, normally pastry is not my strong point but I recently bought a pastry blade from Lakeland and it has revolutionised my pastry making. It means that even without a full sized food processor, I can whip together a batch of pastry within 10 minutes and no sticky hands and scrubbing pastry from under my wedding ring! I love how this apple pie turned out. 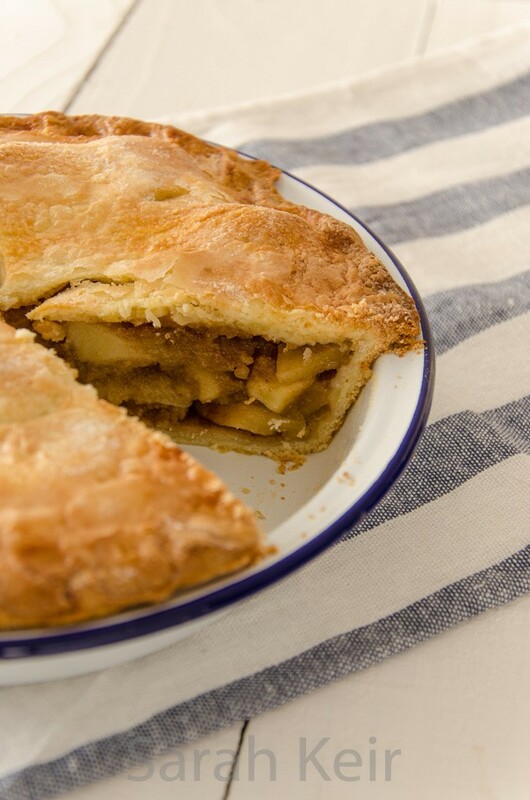 Having kept the filling simple, the apple flavour really does shine through. Perfect for serving warm with custard or ice-cream or cold with cream. Mmmm! Go on, spoil someone this week with this old-fashioned recipe. Preheat the oven to 200 ºC/180 ºC fan. 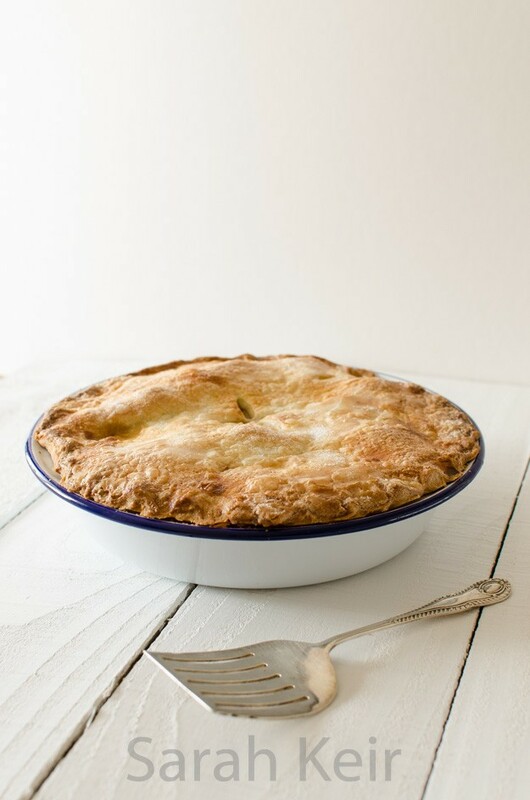 Grease a 20cm pie plate with butter. Make the pastry by rubbing the butter into the flour, icing sugar and salt, either by hand, food processor or pastry blade, until it resembles breadcrumbs. Crack the egg into the pastry and gently mix with your hands until it comes together into a ball. If the mixture is too dry, add a drop or two of cold milk or water. Wrap the pastry in cling film and put in the fridge to rest and cool for about an hour or more. Peel the apples, place in a large bowl and sprinkle with the lemon juice to stop them turning brown. Add the sugar and spices and mix well. Put in a large saucepan and over a medium heat, cook gently for 5 minutes until the apples are tender but not complete mush. Remove from the heat and allow to cool completely. Divide your pastry in half and on a worktop dusted with flour, roll out to about 1/2 cm thick. Transfer the pastry to the pie plate by drapping over the rolling pin. Ease the pastry into the dish, making sure it is well pushed into the sides. Sprinkle the base of the pastry with a handful of ground almonds, dry cake crumbs or bread crumbs; this will absorb excess water from the apples so the bottom of the pastry crisps up. 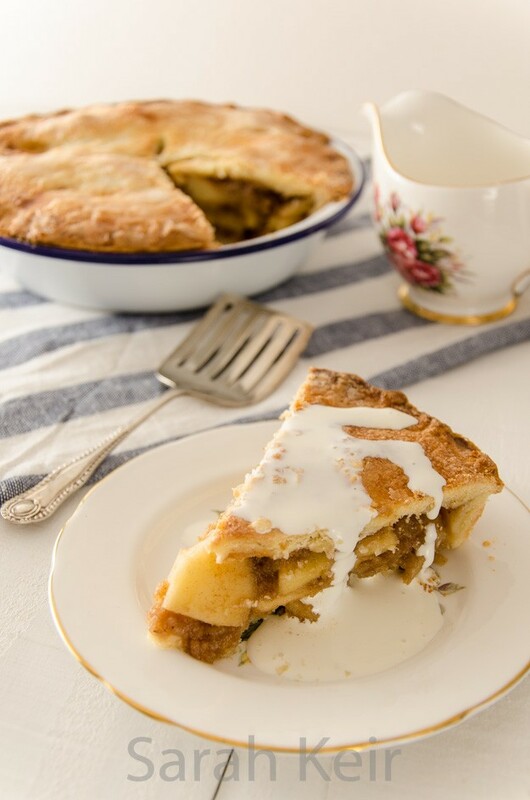 Pack in the cooled apple mixture into the pie; it should be domed high as it will sink down. Roll out the other half of the pastry, also to 1/2 cm thick. Run a line of egg wash around the rim of the pastry in the tin. Carefully lift the lid onto the top of the pie. Use your forefinger and thumb to firmly crimp the edge of the pastry to ensure bottom and lid are well glued together. Brush the top of the pie with the egg wash and sprinkle over the caster sugar. With a small sharp knife, make a couple of small slits in the top of the pie so that steam can escape. Place the pie in the preheated oven for 40-45 minutes until golden and firm. Serve immediately or allow to cool.